Blogging can be a lonely job at times. I don't mean to say this in a pitiful "woe is me" manner but truthfully, writing itself is often a solo experience. But blogging in particular is one arena where passionate people write by themselves at home rather than in an office surrounded by other writers. Bloggers can be also be vulnerable to a few things and one thing in particular is getting on the wrong side of the law. We don't have a battalion of lawyers to negotiate and clean up any problems we may encounter. Couple that with the fact that law is slow catching up with technology. Few of us are lawyers and have legal experience - myself included. Recently, I had some copyright issues where a recipe of mine appeared to be adapted by an Australian food magazine without credit. The idea and styling was mirrored and the recipe was like an abridged version of mine. The editor staunchly denied having used my blog as a reference but then in the same breath said that she had no idea who on her staff wrote it. It was quite possibly the most maddening conversation I've had in a long time. At the end she said that the similarities were sheer coincidence, down to the last line of both recipes which were alarmingly similar. It certainly left a bad Taste in my mouth. It got me to thinking. I can't be the only one that struggles with the whole legal arena surely? That's where I've asked Jessica Meddows, lawyer and blogger to clarify a few things for Australian food bloggers. Each country has different laws and each genre of blogging has specific concerns but as I am a food blogger I commissioned Jessica to write a blog post on food blogging issues in Australia. I'm delighted to share this with bloggers and future bloggers out there and I hope that this clarifies issues, allows blogging to move forward as an industry and allows us to avoid those dreaded legal letters! And Jessica will be on hand to answer any general legal questions you may have so please feel free to ask them as comments. So tell me Dear Reader, if you're a blogger, do you worry about being sued or having your copyright violated? Food blogging is a wonderful adventure. It’s creative. It’s technical. It’s analytical. It’s educational. And it’s delicious! But like any job that’s interesting and fun, there’s also the business side. In this instance we’re looking at the legal issues related to food blogging. Some seem obvious, like not copy-typing recipes in their entirety. Others aren’t so obvious, like whether the styling of your photos is protected. Copyright is a legal framework which protects original, artistic works, like writing and photography. It gives you the exclusive rights over your work for a period of time. In Australia, the duration of protection for writing and photography is for the creator’s life, plus 70 years. Copyright is inherent in Australia and in other countries that are a party to the Berne Convention. You don’t need to include the copyright symbol or a statement about copyright on your blog posts to be protected. You also don’t need to register your copyright in Australia (unlike the United States). All that is needed to attract copyright protection is that the work must be original and expressed in a tangible form. b) for evidentiary issues in the unlikely event a legal dispute emerges. Recipes are protected by copyright, but the protection is on the thin-side. Blogging step by step instructions of how you created a meal is protected. Another writer cannot simply copy and paste your work into their blog and pass it off as their own. If anyone wants to reproduce your work or a portion of it, it must fall within one of the exceptions to copyright in the Copyright Act (Cth) 1968. The exception relevant to bloggers is the criticism or review exception. You can use copyright material without the owner’s permission, as long as it is for review or criticism and “a significant acknowledgment of the work is made.” So what is involved in a review or criticism under this section of the Copyright Act? The Federal Court has stated that it needs to be a judgment of the material or its underlying ideas. It can be strongly expressed. It can be humourous. It doesn’t even need to be fairly balanced. But what the courts have made clear is that the purpose of the review must be genuine. The usage must also be considered “fair”. The Federal Court has said that when they look at what is “fair”, they look at whether the copyright owner would be out of pocket, and whether the person used the material for commercial purposes. But what is fair depends on the circumstances in every case. The Australian Law Reform Commission recently recommended substantial reworking of the Copyright Act and specifically recommended including similar exemptions to the “fair dealing” laws in America. The theory is that this will be clearer than the current exceptions. While written recipes are protected, methods and techniques of cooking, lists of ingredients and quantities are not protected. This is because copyright protects the expression of an idea, and not the actual idea itself. So you can create your raw, vegan, zucchini based lasagne, and another blogger can create their own version using the same ingredients and techniques. The photographs you take are also protected by copyright. This means that someone cannot use your photographs in any way without asking your permission. Some people think that they are complying with copyright rules by attributing the photograph to the creator, but permission is required. Then there is the issue of how your food and photograph is styled. You can prepare a beautiful arrangement of food, and there is nothing to prevent another person using your presentation. However, if you have a certain style and this has been recreated on another blog, there may be an argument that this is covered by the law of “passing off”, which is a separate legal concept to copyright law. 3) Copyright: What Material Can You Use? Firstly, an idea is not protected by copyright legislation. As I mentioned above, if you like someone’s idea of a raw, vegan, zucchini based lasagne, knock yourself out creating it and posting it on your blog. If you see something on Jamie’s Cooking, MasterChef, or even at a live demonstration at a food festival, you can create the dish at home and blog about it. But it’s courteous and ethical to quote the source of your inspiration (and similar to the legal concept of “moral rights”, discussed in more detail below). 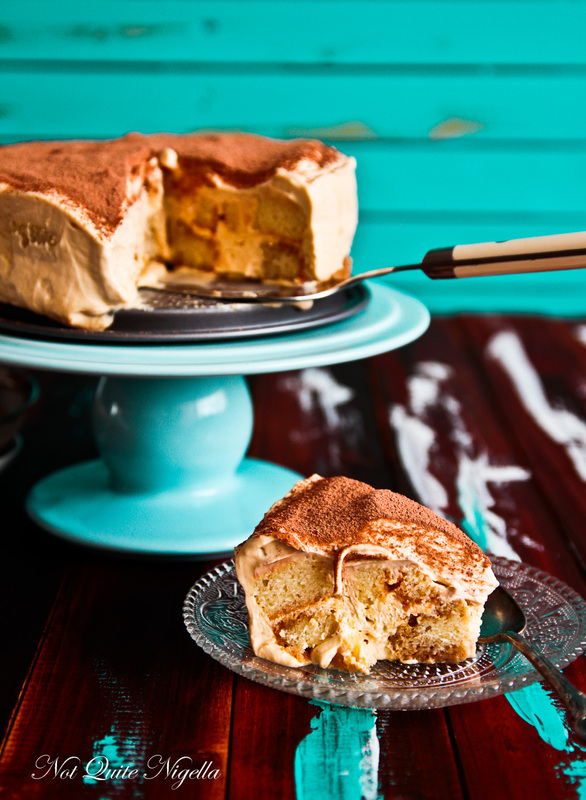 So can you copy an already published recipe on your blog? Unless it’s for the purpose of review and criticism, and can satisfy the “fair” requirement described above, it’s safer instead to write about your own experience creating a recipe. But if you really want to use someone’s recipe word for word, you can always ask permission. A lot of people are happy for the free publicity, as long as you attribute them as the creator of the work. The other reason why I think it’s useful to ask people in advance, is because there are cases where bloggers have significantly modified recipes, provided attribution and have still been asked to take down the allegedly breached copyright material. Taking photos of dishes in restaurants does not breach any copyright. Being private premises, the owner of a restaurant or café can ask you not to take photos. And if you don’t comply with this, they can ask you to leave. Practically though, this is unlikely to happen. c) integrity of authorship - not to have their work changed without their consent. The moral rights of authors continue for their lifetime, plus 70 years. You can, however, consent to acts which would usually infringe these rights. Say for example, you’re an employee in a company, writing a press release and the name attributed to the press release is that of your managing director. To do this, you need to provide your written consent. One of the lovely things about the food blogging community is that it has intuitively picked up on the moral rights concept. Attribution is the status quo and a lack of doing so is poor food blogging etiquette. Defamation is a communication to at least one person that can have the effect of damaging the reputation of another person, where the communicator has no legal defence. So how does a food blogger write a review of a restaurant or recipe book without worrying about being defamatory? In Australia, the defences are: truth, absolute privilege, qualified privilege and honest opinion – the latter being the most relevant to food bloggers. c) based on proper material (material which is substantially true). A Sydney Morning Herald restaurant reviewer, Matthew Evans, gave a trouncing to Coco Coco restaurant in 2003. Evans amusingly described their pork belly as “the porcine equal of a parched Weetbix”. Shortly after, the restaurant shut down and the owners launched proceedings against Fairfax. This case went to the High Court, with Fairfax losing. What can we take from this? Perhaps don’t describe food as parched Weetbix, unless you have actually consumed parched Weetbix, and honestly believe that the dish and the parched Weetbix share the same qualities! Since the Gutnick and Dow Jones defamation case, you can be liable for defamation anywhere in the world where your material is downloaded and read. And you’ll be subject to the laws of the country where your blog is accessed. This sounds intimidating, but the likelihood of this happening is very small. Late last year the ACCC released guidance on what bloggers and online review businesses should disclose, similar to the existing U.S. Federal Trade Commission Endorsement and Testimonial Guidelines. Clare from Melbourne Gastronome blogged a detailed summary of the ACCC’s guidelines and their effect on bloggers. The guidelines specifically state that where you have received an incentive or a reward for a review, you should place this prominently on your page. The ACCC even provides useful templates for doing so, if you’re stuck for ideas on how to disclose this information. Law aside, it’s still good etiquette, in my opinion, to disclose any interests you have or may have when reviewing a product or service. Not Quite Nigella does this in a classy and discreet manner, as you can see in her Lobster Tales post. 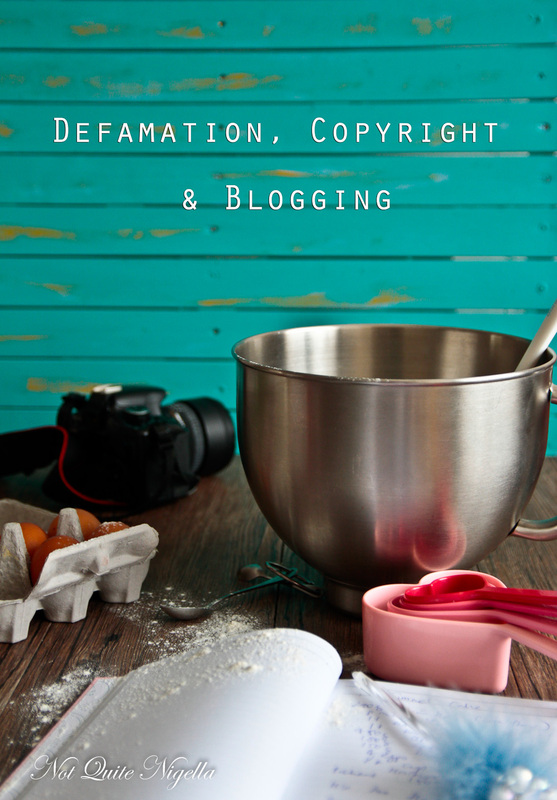 So now you have the basics of copyright and defamation as they relate to issues in food blogging, how do you protect your own work? My suggestions are to tell your readers how much use you are happy with. You can tell them that you’d like to be attributed for your work, and that you’re happy for a paragraph (or however much you like) to be used. My blog has a clear example of what I’m happy for readers to use and the attribution I’d like. With your photographs, you can always use watermarks ranging from discreet to big and flashy. This list isn’t exhaustive by any means. The legality of the food blogosphere is a complicated beast! Do you have any other issues you’ve come across or have been surprised by? Disclaimer: This column does not create a solicitor/client relationship and is not intended as legal advice. You should always seek specific legal advice for your particular circumstances and with a lawyer who is skilled in the area and jurisdiction relevant to your circumstances. Jessica was admitted as a lawyer to the Supreme Court of New South Wales in 2005. She is a freelance content creator and lawyer, having regained custody of her soul after 12 years in the legal industry. 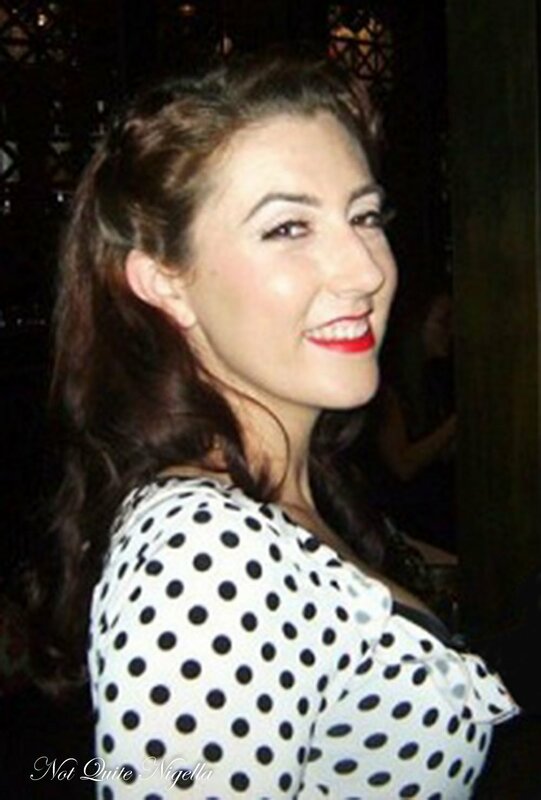 She writes a monthly column on legal issues in the publishing industry at LitReactor, blog posts for Gypsy Girl, and updates on her travel blog North & South Nomads. You can connect with her on Twitter and far too many other forms of social media. She is also a vegan, possibly because of her love of animals, possibly because of her love of being insufferable. She would live in the ocean if it was physically possible, but until then, she lives in Toronto, Canada. recipeWhat Stories Did You Like in 2013?